The end of a tenancy agreement means renters should leave their property the way they found it. An unclean property is one of the biggest causes of deposit disputes between landlords and tenants, with 88% of lettings agents in a 2017 ARLA survey citing a dirty rental property as the main reason for money being withheld. 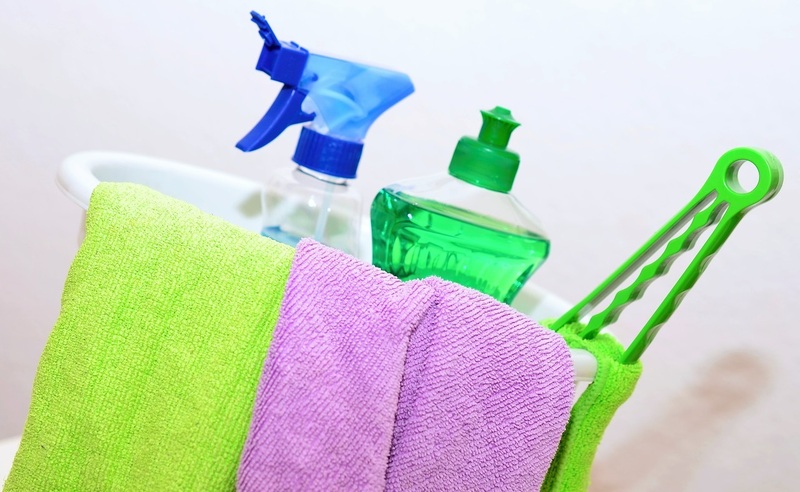 We would always recommend hiring a professional cleaner to ensure your property is up to standard before you leave. However, if you don't want to pay out for a cleaning company, then follow our essential guide to a property clean below. This will help you avoid any kind of deposit dispute with your landlord. Before you start your big clean, clear away any clutter and move your furniture out of each room. Having a clear space to work in will make the process easier and ensure you get into those hard-to-reach places that are often neglected. Secondly, give yourself more time to clean than you think you need - you won't do a good job if you are rushing around with only a few hours to spare before the inspection. Appliances such as the microwave, kettle and fridge can build up more grime than you'd expect. Make sure you give these a good clean both inside and out. Use a de-scaler on the kettle to rid it of limescale build-up. A bottle of anti-bacterial spray, meanwhile, is a must for your fridge and microwave surfaces. Grease and grime can take hold in even the most clean of kitchens. Make sure you fully clean the oven, and also the extractor fan above it. This is usually the first item checked during inspections and removing burned-on food from the bottom of the oven will require time for some serious elbow grease, so don't leave it until the last minute. These items are very easy at picking up dirty finger prints or streaks, a good wipe down is the perfect solution to help brighten up a room. It gets everywhere! Make sure you wipe down any fans, blinds, shelves, curtains and countertops. The best way is to work from top to bottom to save you from doing it twice. When all your food has been removed, a simple wipe down of the inside and outside will get rid of any crumbs and drips. It's quick and simple and shows you have shown attention to detail. Make sure you scour all bathroom showers, tubs, sinks and toilets. If your bathroom is tiled don't forget to give those a good clean too. Depending on the area you live in, hard water can be a big problem for limescale. White vinegar is great at tackling limescale but if there is a lot then you may have to invest in some more heavy duty limescale remover. These areas are subjected to the most traffic and tend to gather lots of dust and dirt, so be sure to give these a thorough vacuum. Even a shake and vacuum solution can make a significant improvement to a dirty carpet. For a more soiled carpet you may want to consider renting a steam cleaner. Upholstered furniture can get quite grubby in a short amount of time. If it's hard surfaced, a good scrub will remove dirt but if you are dealing with fabric, vacuuming with a dry wash might be required. To make sure nothing is left behind, once a drawer has been cleared and dusted leave it open. When you walk around the property to do your final checks, the drawers and cupboards in each room should be pulled out - if not then something has been missed and will need to be cleared. If your rental property comes with a garden make sure the grass has been mowed, especially if you have lived there for a while. If needed, give the area a good sweep, making sure that there aren't more leaves on the ground than there are in the trees! Any scuff marks on the walls might be able to be wiped off, but if that doesn't work then you may need to paint over these. Before any painting starts ensure you have the correct colour to hand and take care. Before you leave, walk through your home with pair of critical eyes and check to make sure there aren't any unpleasant smells lingering. Once you're happy with how the property looks sit back and relax - your job is done! Before you vacate a rented property, don't forget to check your tenancy agreement so you're confident you know what is expected of you. If you have any questions speak to your local Whitegates office.